Instead of putting my money in Bank Fixed Deposits, isn’t it better to invest all my money buying bank stocks? After all stock markets give better returns right? There are three things wrong in that guy’s thought process. Lets see that in the reverse. Yes. It is true that Equity is the best form of investment which can beat inflation. But you need to remember that it works that way only in the long term. If you are thinking of putting in money and taking it out for some urgent personal expense within a year – please run away from equities. Anything less than 7 years isn’t long term enough. For some sectors or stocks even that isn’t a good enough time period. Short term volatility will give you heart aches. Usually people investing in fixed deposits look at a time horizon of 1-2 or maximum 3 years. Of course you can invest for a maximum of 10 years in FDs, but normally people don’t do that. You need to also remember that, even though stocks give higher returns, FDs have fixed returns. Whatever happens to the stock price, you will get assured returns of around 8-9%. 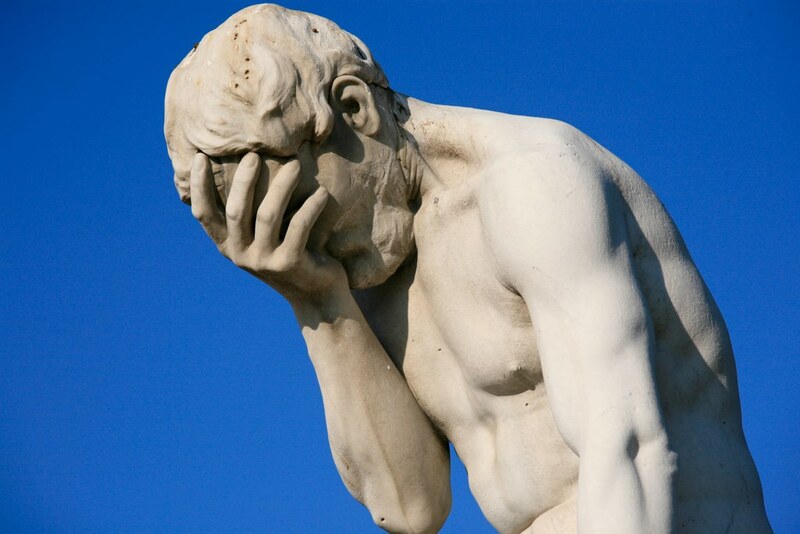 This is classic mistake that people do when they hear of the phenomenal returns given by a few stocks. They put in all their money into equities. Even worse they put all their money in a specific sector or even a single stock. I have heard of people saying “Banks are very important to an economy and its not like they will shut shop. Let me put in all my life savings in buying bank stocks”. Lot of investors have their own favourite stocks/sectors and its driven by nothing logical/fundamental other than hearing their friend or neighbour talk about it. Remember the saying “Never put all your eggs in one basket”. Putting all your hard earned money in a single instrument is dangerous. A single bad news and your favourite company’s stock might never recover back to its highs. The same rule applies to equities/debt/gold/real estate. You should learn to diversify your investment across different asset classes based on your financial goals, age, retirement year, etc. First understand the basic difference between a Fixed deposit and buying a stock. When you deposit money in a bank FD account, you are giving permission to the bank to lend it to other borrowers. You are loaning the money to someone else through your bank. The borrower pays an interest for the money borrowed to the bank, the bank takes a percentage as its profit and pays the remainder as interest to you at the end of the term. When you buy a stock of a company (a bank in this case), you own a part of that company/business (that’s why it’s called a share). The money you put in has now become the actual company itself. The only way you will make a profit out of your investment is when the company’s performance is good. If the company runs into a rough patch and is making losses and finally shuts down, your investment is all gone (at least mostly gone). But if you had a FD in that bank, the bank tries to makes sure that your money is returned back to you before it can pay back its investors. Also RBI (Reserve Bank of India) makes sure that all depositors are protected by an insurance up to a maximum of Rs. 1,00,000. So even if the bank shuts down without recovering its loans, Rs. 1 lakh of your deposit & interest is safe. Such insurance isn’t available in the stock market, thus making it a riskier mode of investment for your money. But remember with higher risks you also get the benefit of higher rewards. So, next time you hear someone asking if putting their money in FD or equity is safer, you know what to reply to them. Everyone knows that equity markets are quite volatile in nature. There are wide swings in the stock prices or the index values over a period of time. From my previous post you should’ve known that I invested in various mutual funds when the market was peaking out in the end of 2007. After January 2008, the markets crashed and I didn’t invest even a single rupee. Instead if I had put in all my money in October 2008, I would be sitting on a nice profit. Unfortunately, hindsight is always 20/20. No one could’ve known that the market was going to crash in January and it reached the bottom in October. Contrary to what anyone may say, no one can time the market. What else can you do instead of trying to time the markets? Everyone wants to buy at the lows and sell at the highs, right? In simple terms, you invest a fixed amount and buy stocks or a mutual fund for that amount every month. The number of stocks or the units of the fund will vary every month due to the volatility in the market. But over the longer time period, things will average out and you will end up with higher profits than investing in lump sum. This is called as Systematic Investment Plan or SIP for short. Lets see an illustration with some sample numbers. You are willing to invest Rs. 10000 per month in a mutual fund scheme (for a year). The NAV of the mutual fund will vary over the period of time. Lets see how many units of the fund you get every month. By investing a small amount every month, you would’ve around 10425 units of the fund invested at an average rate of NAV of 11.57. Lets assume you instead put in the entire Rs.1,20,000 at the average NAV 11.57, your account would have only 10371.65 units. You got 53.36 units for free by spreading out your investment. This is free money with no work done on your part. Who doesn’t want this? This will be even more when invested in the longer time frame. This number would’ve been even higher if it was a bear market and every month you keep getting more units than the previous month. Of course, this means in a bull market you lose out on the opportunity of investing in bulk at the beginning. But no one knows if we are currently in a bull market or a bear market, as its all in retrospective. Here is a nice graph of a real world fund which shows how SIP gives you a better return. 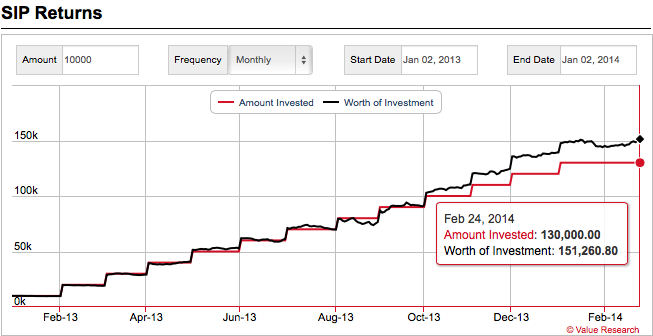 Investing Rs.10000 every month for a year from Jan 2013 to Jan 2014 (13 months), we have made a decent profit. Part of the profit is due to the fund’s performance and NAV increase and part of the profit is also from the SIP. SIP works out as a nice hedge against wide fluctuations in the market and also makes sure you keep investing in the market whatever happens – as in equity only long term counts. So, if you are salaried and has even a little bit of surplus cash, go start an SIP on a good mutual fund and invest every month. It doesn’t matter what happens to the market every day, you will be profitable in the longer term. Even if you aren’t salaried, invest regularly instead of trying to time the markets.